As Talk Normal, drummer Andrya Ambro and bassist-guitarist Sarah Register share more than vocal duties: Both are sound engineers with a palate for dissonance and musical minimalism. But the Brooklyn duo’s chemistry transcends the music they make; in conversation, Ambro’s and Register’s words weave together so fluidly, it’s hard to tell who’s speaking. 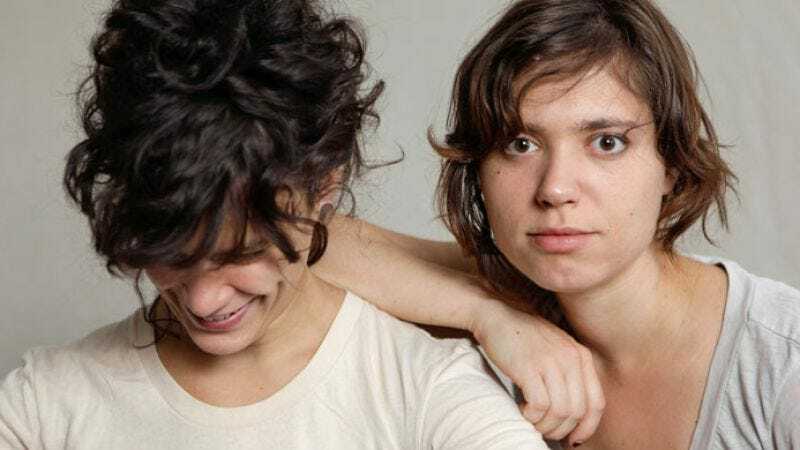 The cerebral twins released their first EP, the raw Secret Cog, in 2008 and defined their brutal sound with the harsh 2009 full-length, Sugarland. Talk Normal—which opens for Xiu Xiu this Saturday at the Hi-Dive—talks about why the no-wave label works well for music critics, but not always for musicians. The A.V. Club: You two met at NYU and were friends for a long time before making music together. What lead to the formation of Talk Normal and your first band, Antonius Block? Andrya Ambro: Originally, Antonius Block was guitarist Jorge doCouto and singer Tina Schula. I recorded their album, and that’s also how I kind of became their drummer. We began looking for a bassist or another guitar player, and Sarah [Register] expressed interest. She joined the band, and learned the songs quickly. That band dissolved about six months later due to health issues, but from that, Sarah and I realized we were on the same page. There was a simplicity that came from Antonius Block; it was raw and minimal, and we wanted to continue that. AVC: The no-wave label has been used quite a bit to describe Talk Normal. Do you consider bands like Teenage Jesus And The Jerks or influential to your sound? Sarah Register: No-wave has been kind of thrown at us for a couple of years now, and I see why there’s a need to label something in five words or less. But, no, it was not music that influenced my personal aesthetic. I heard a lot of those bands later on and I like the sound, and I definitely see the comparisons. But it wasn’t something I went in with and tried to emulate. AA: I did listen to those bands years ago and I was influenced more or less by DNA, although not so much by other no-wave bands. It was a big movement that I certainly respect, but it encompassed a lot; it was a movement in film and art, too. I think we’re labeled no-wave mainly because of the discordant guitars, and if you want to get specific, what people call our “primitive” drums. What makes them primitive? The fact that I don’t use cymbals? I don’t know. I understand the no-wave thing, but I think we have a lot more structure and melody going on, and intricacies in arrangement. We’re minimal and simple and raw, and those were aspects of the no-wave movement. But if it’s just about making crappy things into something beautiful, we can relate to that too, if you want to draw parallels. But you can draw parallels to lots of things. I’m not going to fight to prove it—people are just going to have to listen to us. AVC: What’s the story behind the title of your latest record Sugarland? AVC: Is there a method to your music writing? AA: Sometimes [an idea or song] will start out conceptual: What if there was one element that continues? Or one drumbeat that stays the same through the whole song? We mess around with loose concepts like that. But it can get more grandiose and we’ll have to strip what we’ve created down. AVC: How do your sound engineer backgrounds come into play when you’re recording? AA: I think engineers pay attention to music with a different perspective; I’ve definitely listened to music a lot more intently because of this. I’m also at a different level of listening than I was 10 years ago. We’ve been going into the studio more [and working with others], because we needed the freedom to just create. We had to separate ourselves just a little bit because mixing can get neurotic, especially when it’s your own stuff. It’s nice to have that distance, even when we both want control. In the beginning, it was a part of defining our sound because we could manipulate the way our recordings sounded ourselves and that was important to us. I really like those recordings. I would like to do that again, but its nice having other people work on our music too. I’ve always done sound for independence in music and to create music, so I would know things and not have to ask others for help.